Today the First Regiment South Carolina Volunteers (Union), a regiment of former slaves based in Union-controlled Beaufort, returns from an exploratory expedition in South Georgia and Florida. Many Baptists serve in the regiment. They and their fellow soldiers know that the regiment’s white officers are evaluating their performance as the United States government contemplates raising and equipping black regiments to fight in the war. The soldiers have served competently and bravely on the expedition, and today Col. T. W. Higginson writes up his report of the expedition. His account offers assurances that former slaves should be recruited for active military service. Report of Col. T. W. Higginson, First South Carolina Infantry (Union). The expedition has carried the regimental flag and the President’s proclamation far into the interior of Georgia and Florida. The men have been repeatedly under fire; have had infantry, cavalry, and even artillery arrayed against them, and have in every instance come off not only with unblemished honor, but with undisputed triumph. On another occasion a detachment of about 250 men, on board the John Adams, fought its way 40 miles up and down a river regarded by the naval commanders as the most dangerous in the department — the Saint Mary’s –a river left untraversed by our gunboats for many months, as it requires a boat built like the John Adams to ascend it successfully. The stream is narrow, swift, winding and bordered at many places with high bluffs, which blazed with rifle-shots. With our glasses, as we approached these points, we could see mounted men by the hundred galloping through the woods from point to point to await us, and though fearful of our shot and shell, they were so daring against musketry that one rebel actually sprang from the shore upon the large boat which was towed at our stern, where he was shot down by one of my sergeants. We could see our shells scatter the rebels as they fell among them, and some terrible execution must have been done, but not a man of this regiment was killed or wounded, though the steamer is covered with bullet-marks, one of which shows where our brave Captain Clifton, commander of the vessel, fell dead beside his own pilot-house, shot through the brain by a Minie ball. Major Strong, who stood beside him, escaped as if by magic, both of them being unnecessarily exposed without my knowledge. Nobody knows anything about these men who has not seen them in battle. I find that I myself knew nothing. There is a fiery energy about them beyond anything of which I have ever read, except it be the French Zouaves. It requires the strictest discipline to hold them in hand. During our first attack on the river before I had got them all penned below they crowded at the open ends of the steamer loading and firing with inconceivable rapidity, and shouting to each other, “Never give it up.” When collected into the hold they actually fought each other for places at the few port-holes from which they could fire on the enemy. Meanwhile the black gunners, admirably trained by Lieutenants Stockdale and O’Neil, both being accomplished artillerists, and Mr. Heron, of the gunboat, did their duty without the slightest protection and with great coolness amid a storm of shot. This river expedition was not undertaken in mere bravado. Captain Sears, U. S. Army, the contractor of Fort Clinch had urged upon the War Department to endeavor to obtain a large supply of valuable bricks, said to remain at the brick-yards, 30 miles up the Saint Mary’s, from which Fort Clinch was originally supplied. The War Department had referred the matter to Colonel Hawley. who approved my offer to undertake the enterprise. 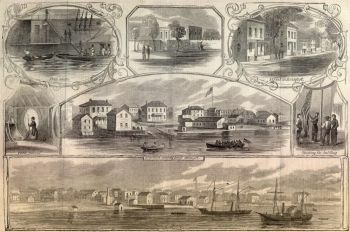 Apart from this, it was the desire of Lieutenant Hughes, U. S. Navy commanding U. S. steamer Mohawk, now lying at Fernandina, to obtain information regarding a rebel steamer, the Berosa, said to be lying still farther up the river, awaiting opportunity to run the blockade. Both objects were accomplished; I brought away all the bricks and ascertained the Berosa to be worthless. I have the honor to states that I have on board the Ben De Ford 250 bars of the best new railroad iron, valued at $5,000, and much needed in this department This was obtained on Saint Simon’s and Jekyl’s Islands, Georgia, from abandoned rebel forts, a portion of it having been previously blown up and collected by Captain Steedman, of the Paul Jones. I have also eight large sticks of valuable yellow-pine lumber, said to be worth $700, which came from Saint Mary’s, Ga. There is also a quantity of rice, resin, cordage, oars, and other small matters suitable for army purposes. On board the John Adams there is a flock of 25 sheep from Woodstock, Fla. I have turned over to Captain Sears about 40,000 large-sized bricks, valued at about $1,000, in view of the present high freights. I have also turned over to Judge Latta, civil provost-marshal at Fernandina, 4 horses, 4 steers, and a quantity of agricultural implements, suitable for Mr. Helper’s operations at that location. I have seen with my own eyes, and left behind for want of transportation (and because brick was considered even more valuable), enough of the choicest Southern lumber to load steamers like the Ben De Ford–an amount estimated at more than 1,000,000 feet, and probably worth at Hilton Head $80,000. I also left behind, from choice, valuable furniture by the houseful — pianos, china, &c., all packed for transportation, as it was sent inland for safe-keeping. Not only were my officers and men forbidden to take any of these things for private use, but nothing was taken for public use save articles strictly contraband of war. No wanton destruction was permitted, nor were any buildings burned unless in retaliation for being fired upon, according to the usages of war. Of course no personal outrage was permitted or desired. At the same place we obtained a cannon and a flag, which I respectfully ask for the regiment to retain. We obtained also some trophies of a different description from a slave-jail, which I shall offer for your personal acceptance — three sets of stocks, of different structure, the chains and staples used for confining prisoners to the door, and the key of the building. They furnish good illustrations of the infernal barbarism against which we contend. Of the Planter I have hitherto said nothing, as her worn-out machinery would have made her perfectly valueless but for the laborious efforts of Captain Eldridge and her engineer, Mr. Barger, aided by the unconquerable energy of Captain Trowbridge, of Company A, who had the command on board. Thanks to this they were enabled during our absence up the Saint May’s to pay attention to the salt-works along the coast. Finding that the works at King’s Bay, formerly destroyed by this regiment, had never been rebuilt, they proceeded 5 miles up Crooked River, where salt-works were seen. Captain Trowbridge, with Captain Rogers’ company (F) and 30 men, then marched 2 miles across a marsh, drawing a boat with them, then sailed up a creek and destroyed the works. There were 22 large boilers, 2 store-houses, a large quantity of salt, 2 canoes, with barrels; vats, and all things appertaining. We found no large number of slaves anywhere; yet we brought away several whole families, and obtained by this means the most valuable information. I was interested to observe that the news of the President’s proclamation produced a marked effect upon them, and in one case it was of the greatest service to us in securing the hearty aid of a guide, who was timid and distrustful until he heard that he was legally free, after which he aided us gladly and came away with us. No officer in this regiment now doubts that the key to the successful prosecution of this war lies in the unlimited employment of black troops. Their superiority lies simply in the fact that they know the country while white troops do not, and, moreover, that they have of temperament, position, and motive which belong to them alone. Instead of leaving their homes and families to fight they are fighting for their homes and families, and they show the resolution and the sagacity which a personal purpose gives. It would have been madness to attempt, with the bravest white troops what I have successfully accomplished with black ones. Everything, even to the piloting of the vessels end the selection of the proper points for cannonading, was done by my own soldiers. Indeed, the real conductor of the whole expedition up the Saint Mary’s was Corpl. Robert Sutton, of Company G, formerly a slave upon the Saint Mary’s River, a man of extraordinary qualities, who needs nothing but a knowledge of the alphabet to entitle him to the most signal promotion. In every instance when I followed his advice the predicted result followed, and I never departed from it, however slightly without finding reason for subsequent regret.